NOSE: Rogue beers tend to be famously unbalanced, but the Brutal Bitter, despite its name, is well-crafted and very carefully calibrated. A variety of malts lend an aroma of sweetness and complexity which is met in force by an aggressive hop profile chock full of citrus and pine aromas. Everything works wonderfully in the nose. TASTE: Excellent. The malt backbone is robust, rich, and full without being overly sweet or roasted. The hop profile is the star of the show but it doesn’t overwhelm the palate and the bitterness in the finish is subtle and refreshing. MOUTHFEEL: Medium-bodied with wonderful carbonation. Rolls around beautifully on the tongue and is slightly drying without being astringent. DRINKABILITY: Very high. 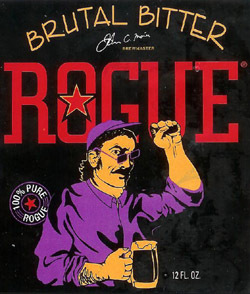 This is Rogue’s session beer and it shows that, when they want to, Rogue can compete with the best of them. I just wish they wanted to more often. Posted in Tasting Notes.Tagged Brutal Bitter, ESB, J. Clyde, Rogue. A grabbed the Brutal Bitter a couple months ago when we did our very first Podcast on top Session Beers – http://bit.ly/cM40kY. Unlike most of Rogue’s offerings, I was not disappointed and have since had a couple more bottles tumble into my cart on occasion. Absurdly awesome beer and a must try for anyone that likes things that are good. Ooo, ooo, I like things that are good! Gotta pick up a bottle, it seems. Previous Post SAM ADAMS: BREWER. PATRIOT. PHONY?